Inspired: An Improv Blog Impride Workshop! 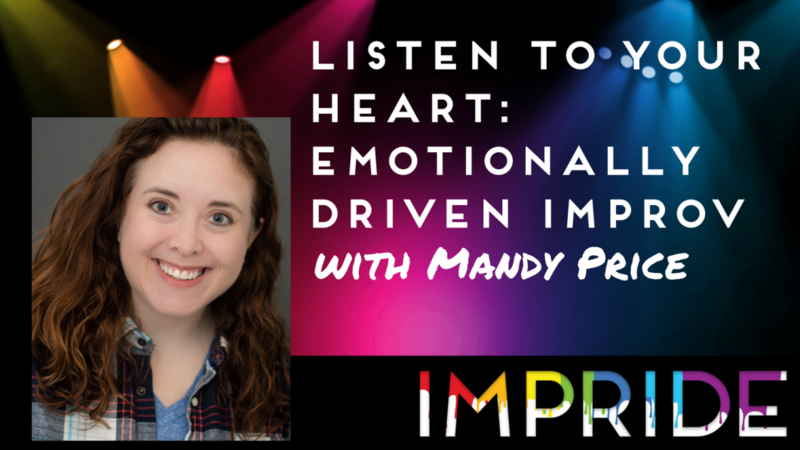 Listen to Your Heart: Emotionally Driven Improv with Mandy Price! Impride Workshop! Listen to Your Heart: Emotionally Driven Improv with Mandy Price! Yes, as improvisers, we love to get laughs. So we often find ourselves going for the quick one-liners and bathe in the audience reaction. But, like that bag of potato chips, the joy is short lived and you’re left with greasy fingers. Satisfying, lasting improv is grounded in reality and emotion. Enter, Mandy Price. Her workshop, “Listen to Your Heart: Emotionally Driven Improv,” will get you to stop thinking so hard about what comes next and create instant and meaningful relationships in a matter of moments! It’ll be the Grindr of improv! Mandy’s workshop will take place on Sunday, July 8th at 10:00am! About the Instructor: Mandy Price is a Jet City Improv cast member and has appeared in many full-length improvised plays, including Lovetanic, Goin’ Steady: The Musical, Austen Translation and Upside Downton at JCI and The Pretty Wonderful Club at Unexpected Productions. She also keeps one foot in the world of scripted theatre, playing The Storyteller in ArtsWest’s production of Bloody, Bloody Andrew Jackson, Kimmi in The Underneath at Annex Theatre and various roles in Wagner Sketches with the Seattle Opera. Mandy is a transplant from Chicago where she performed with The Second City, iO, The Annoyance and Laugh Out Loud Theatre. Originally from Nashville, Tennessee, she holds a BA in Theatre from Belmont University and fights against her accent every day.